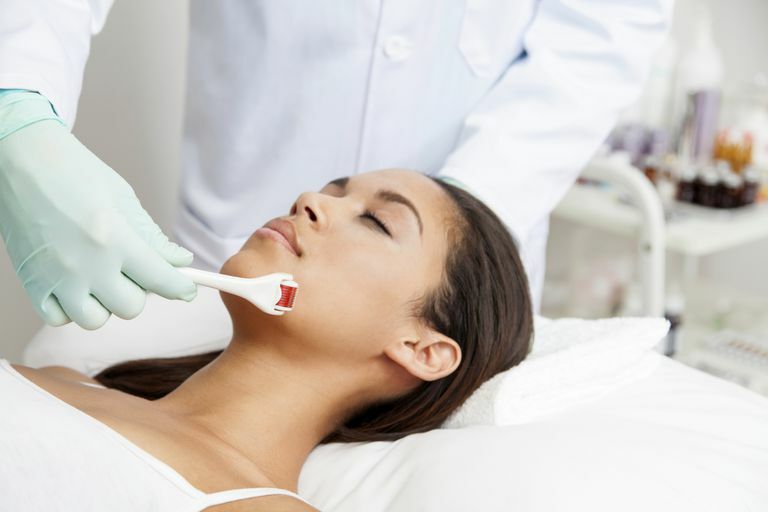 Micro-needling, derma-rolling, or the very-technical-sounding "collagen induction therapy" (CIT) is a minimally invasive cosmetic procedure. Its claims and methods are simultaneously simple, scary, exciting, tempting, and hard-to-believe. The treatment uses a small handheld rolling device called a derma roller which is covered with many tiny closely-spaced needles. As the device rolls along the skin, the needles create tiny holes supposedly without damaging the epidermis. However, it comes with a warning that it is possible to draw blood and that use of a topical anesthetic may be recommended (depending on the length of the needles and amount of pressure applied). The results of one study also caution that quality equipment must be used, as poor-quality devices can leave pieces of broken needles behind in the skin. The idea behind CIT is similar to that of many other non-surgical skin-tightening procedures in that it aims to create a controlled injury underneath the skin's surface, thereby inducing the body to respond by producing more collagen in the treated area. The skin plumps and thickens in response to the stimulus, reducing the appearance of scars, stretch marks, and fine lines. It can be painful if too much pressure is used, although some patients describe the treatment as being only "mildly uncomfortable." The devices are available with different needle lengths, which can also affect the patient's comfort level. In addition, many doctors administer a topical anesthetic before each treatment. Among micro-needling's claims are the improvement of everything from stretch marks and scars (acne, trauma, and even burn scars) to wrinkles and hair loss. It is also said to be useful in dramatically increasing absorption of topically applied skin preparations. There have been a few scientific studies showing micro-needling to be effective in the treatment of scars, especially when combined with different therapies. Specifically, Vitamin C combined with micro-needling showed improvement with respect to firmness and smoothness of skin; as well as post-inflammatory hyperpigmentation, when treating acne scars. These results were reported in the Journal of Cutaneous and Aesthetic Surgery. In addition, micro needling and 15% trichloroacetic acid (TCA) peel was found to be helpful when treating atrophic scars, especially Grade 2 and even severe scars that are Grades 3 and 4. Micro-needling is available as a series of treatments in some dermatologists' or plastic surgeons' offices, but there are also units available for home use. If you're considering a home unit, try to find a doctor first who offers the treatments in his or her office. Your doctor can show you the proper way to safely do the home treatments (if in fact it's recommended at all). He can also help to make sure you don't have any skin conditions that would contraindicate micro-needing. Dhurat R,Sukesh M, Avhad G, Dandale A,Pal A,Pund P. A randomized evaluator blinded study of effect of microneedling in androgenetic alopecia: a pilot study. Int J Trichology. 2013 Jan;5(1):6-11. doi: 10.4103/0974-7753.114700. Doddaballapur S. Microneedling with dermaroller. J Cutan Aesthet Surg. 2009. Jul;2(2):110-1. doi: 10.4103/0974-2077.58529. Garg S, Baveja S. Combination therapy in the management of atrophic acne scars. J Cutan Aesthet Surg. 2014 Jan;7(1):18-23. doi: 10.4103/0974-2077.129964. Liebl H, Kloth LC. Skin cell proliferation stimulated by microneedles. J Am Coll Clin Wound Spec.2012 Dec 25;4(1):2-6. doi: 10.1016/j.jccw.2012.11.001. eCollection 2012. Schwarz M, Laaff H. A prospective controlled assessment of microneedling with the Dermaroller device. Plast Reconstr Surg. 2011 Jun;127(6):146e-8e. doi: 10.1097/PRS.0b013e3182131e0f. Are Non-Surgical Face Lifts a Smart Option?